Golden State Warriors escaped with a 99–98 win over the Houston Rockets in Game 2 after James Harden came up empty in a wild final scramble. OAKLAND, Calif.—As James Harden buried his face in his forearms before taking out his pain on an unsuspecting set of curtains and some defenseless locker room chairs, it became clear Tennyson has a place on the hardwood: 'Tis better to have shot and missed than never to have shot at all. For a remarkable all-around scorer in the middle of another superb showing, for a ball-handler so gifted he could create a shot inside a crowded airplane aisle, for an attack-minded alpha dog who smelled blood in a scramble situation, going down without getting one up was as cruel as it gets. 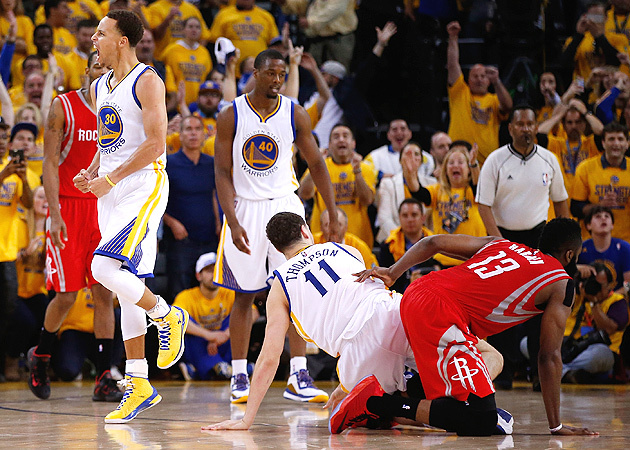 The Warriors escaped with a 99–98 victory over the Rockets in Game 2 on Thursday after nearly blowing a seven-point lead in the game's final 80 seconds. For once, everything was going wrong for a Golden State team in the midst of a season in which virtually everything has gone right, and Harden plunged forward through open court seeking out a game-winner. Collecting the defensive rebound after Harrison Barnes missed a scoop layup, Harden immediately took off in transition with Golden State clinging to a one-point lead and less than 10 seconds remaining on the game clock. This was true opportunity: Barnes had crashed to the court and Draymond Green was out of the play near the baseline, leading Rockets coach Kevin McHale to let Harden go rather than call a timeout to call up a play. "I will take our best player coming downhill in a broken court any day of the week to win the game," McHale said. "That's where James feasts and that's where he's at his best." Harden looked to capitalize on the four-on-three situation, but the Warriors managed to keep their wits within the pending meltdown, as Klay Thompson and Stephen Curry shadowed Harden to protect against a pull-up jumper. "James kind of put his head down and you knew he probably wasn't going to pass in that situation," said Curry, who finished with a team-high 33 points and six assists. "[We wanted] to stand him up." Thompson edged Harden toward the left side of the court to a waiting Curry. The fast break was no longer a break. "They did a good job of having two guys on me so I couldn't attack," Harden said. The top two MVP finishers then traded minor victories: Curry stepped forward and halted Harden's progress near the three-point line, and then Harden shook Curry with a dribble between his legs as the clock ticked under five. At the exact moment one might have expected Harden to take advantage of his shooting window and pull the trigger, Barnes came back into the play and waved at Harden from behind before following Trevor Ariza into the left corner. Now Harden—who nearly posted a triple double with 38 points, 10 rebounds, and nine assists—was stuck, albeit briefly. He had picked up his dribble and the shooting window had closed. He had also missed a split-second opportunity to feed Terrence Jones, who flashed open briefly as he cut down the middle of the key. Here, McHale again thought about calling timeout, but didn't. Turning toward the center of the court, Harden whipped a pass to a trailing Dwight Howard, who rightfully wanted no part of the rock outside the three-point line. Howard, who played well through a knee injury to finish with 19 points and 17 rebounds in 40 minutes, smartly passed it back to Harden, who found himself double-teamed by Curry and Thompson. Suddenly, the Splash Brothers were the Stonewall Brothers, determined not to give Harden an inch of breathing room. The clock kept ticking, and ticking, and there were less than three seconds remaining when Harden received the ball back from Howard. One dribble to his left failed to create enough space, and now the Stonewall Brothers were the Swarm Brothers, digging into Harden's dribble in hopes of prying loose the ball and preventing a shot attempt. What was going through Curry's mind once he realized that the game was in Harden's hands? "Don't let him get a shot off and try to be a hero,'" Curry recalled. The Warriors' joint effort proved successful, as Harden lost track of the ball and fell to his knees as the buzzer sounded. He remained on the court when the ball squirted away, when Curry unleashed a huge howl, and when the Oracle Arena crowd finally exhaled straight into jubilation. "I tried to get the ball back and there was still two guys right there," Harden said. "It's just a tough, tough play." Golden State left so lucky, so charmed, that it might as well have borrowed the Celtics' leprechaun mascot for a night. After blowing a 17-point second-quarter lead before halftime, the Warriors stabilized and rebuilt an eight-point lead with less than two minutes to play. Curry had drained a beautiful long, contested two after a vicious crossover, and the contest seemed all but over. Then, Harden scored six quick points for the scrambling Rockets, while Barnes missed a three-pointer, the Warriors committed an eight-second violation, and Barnes missed his layup on Golden State's final three possessions. [daily_cut.NBA]This wound up being a disaster averted for the Warriors, rather than a potentially series-changing collapse, in part because coach Steve Kerr and his staff had gone over the possibility of a game-deciding scramble. Golden State, always looking to push the pace, fully expected the same from a Houston team that also likes to run. Thompson and Curry were remarkably calm and focused in the game's last few, insane seconds because they were prepared. "We talked about it in the huddle .... to be ready for the attack," Curry said. "We kind of do that in a similar situation where if you get a stop you push it and you see what happens." A highly-entertaining and competitive series now shifts to Houston for Game 3 on Friday, with the Warriors halfway to their first Finals trip since 1975. Kerr was happy to focus on the actual result, rather than what almost happened. "I've never seen any team go through the playoffs with ease," the first-year coach said. "It's hard. Playoff games are hard. ... We faltered at the end but we were able to hang on with a great defensive stand on the last play. We made our share of mistakes in the last minute but we ultimately made the play we needed to make to deny that last shot." Denied, Harden was eventually helped to his feet by a teammate. Streamers came down from the rafters, a sea of yellow shirts screamed their approval, and what had happened on the final play began to sink in. As he departed the court and entered the tunnel, Harden batted a set of curtains with both hands, and they crumpled immediately to the ground. His outward expression of regret was just beginning. "I was kicking chairs," Harden said. "It's frustrating to give the game away like that. ... Ten out of 10 times we'll take that play. It's still frustrating when I know I could have at least got a shot up. It hurts." Harden, the NBA's second-leading scorer, attempted 1,470 shots during the regular season, he had attempted 224 in the playoffs entering Thursday, and he had already attempted 21 as Game 2's final seconds played out. That's 1,715 total shots in 2014-15, and the only one that mattered to him, as he kneeled and hid his face in his arms, was No. 1,716. The one that got away.